Having yourself shot. Putting out fires with your bare hands and feet. Biting your own body and photographing the marks. Sewing your own mouth shut. These seemingly aberrant acts were committed by performance artists during the 1970s. Why would anyone do these things? What do these kinds of masochistic performances tell us about the social and historical context in which they occurred? Focusing on 1970s performance artists Vito Acconci, Chris Burden, Gina Pane, and collaborators Marina Abramovic/Ulay as well as those with similar sensibilities from the late 1980s onward (Bob Flanagan, David Wojnarowicz, Simon Leung, Catherine Opic, Ron Athey, Lutz Bacher, and Robby Garfinkel), O’Dell provides photographic documentation of performances and quotations from interviews with many of the artists. 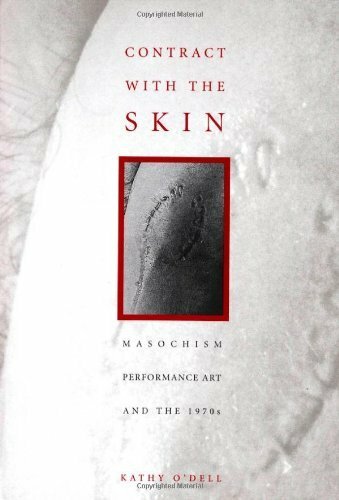 Throughout, O’Dell asks what we can do about the institutionalized forms of masochism for which these performances are metaphors. Text: O’Dell Kathy. cm 18×26; pp. 130; BW ills. ; paperback. Publisher: University of Minnesota Press, Minneapolis, 1998. Request info for "Contract With the Skin . Masochism, Performance Art and the 1970’s"